There are a total of twelve Local Government Areas that have some coverage within the Goulburn Broken Region. Local Governments who have a major area within the Goulburn Broken Region. Local Governments who have a minor area within the Goulburn Broken Region. The Local Government Areas map is intended to show the relative areas and boundaries of each council located within and outside the region. Data to create this map was derived from the Local Government Area layer (L100) of the Department of Natural Resources and Environment's Corporate Geospatial Data Library. This layer describes the post amalgamation LGA boundaries as defined by the Department of Finance. Place names (i.e. 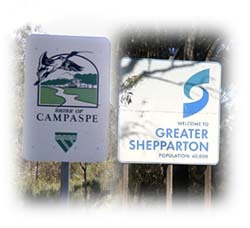 towns) are provided by Vicroads and AUSLIG.